This guide was compiled in early 2015 and will be updated… well… as often as we can get around to it. Things change frequently in Monteverde, people come and go, and we don’t want to send you looking for an artist who doesn’t live here anymore or a store that has already closed its doors. Where possible we have included phone numbers and websites so you can call ahead before heading out in search of a perfect piece of art, but then again, by just getting out walking you may discover any number of interesting places or people that you didn’t even know you were looking for! We begin our tour at the end of the road, at the top of the mountain, up in the mystical cloud forest that is a muse to so many artists. At the top of the mountain is the famous Monteverde Cloud Forest Reserve. There is a large building that houses a restaurant, dormitory rooms and a souvenir shop called Tangara. The store is open every day from 7 am to 4 pm. 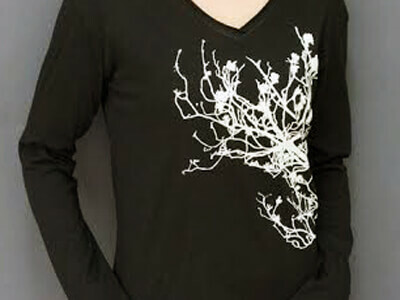 It has a large selection of mostly nature-inspired products. The store is committed to buying Costa Rican and locally if possible. They have a variety of clothing, including rain ponchos and jackets, and many t-shirts – their policy is to not carry shirts that sport beer or commercial logos. 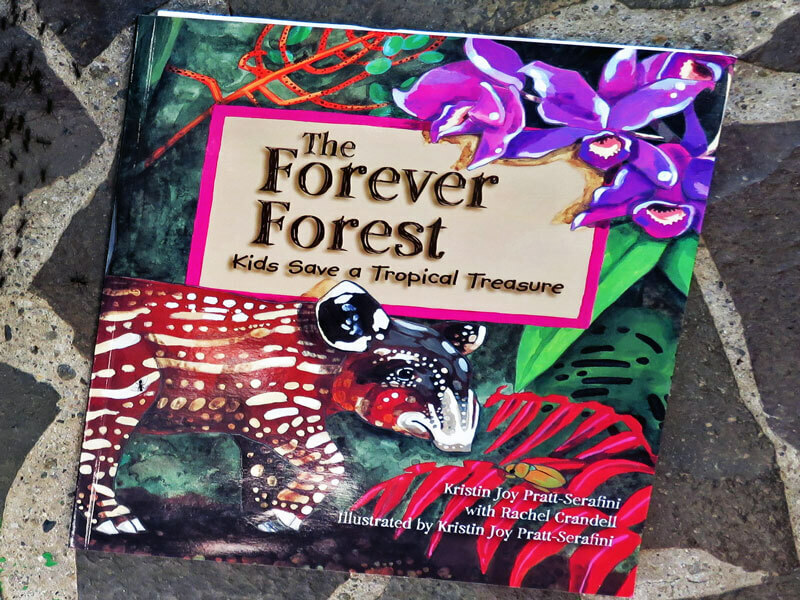 They carry wood items made only from wood that is not endangered; their books are mostly nature-based, and they have many books for children as well as a good selection of nature guides (many by Monteverde authors.) They have some binoculars and a variety of batteries for people who find themselves in this beautiful forest without the necessary technology to record the experience. 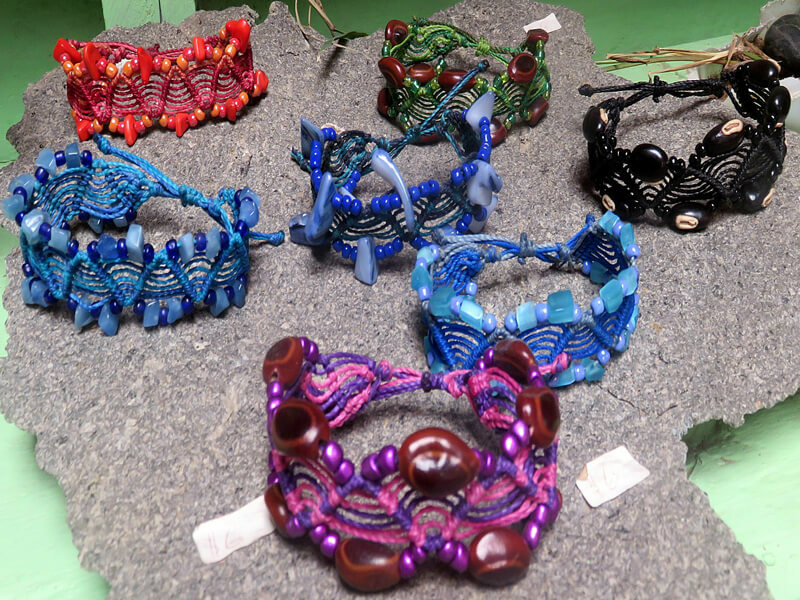 You can find more information about the store at www.cloudforestmonteverde.com. The phone number is 2645 5122, ext 3. 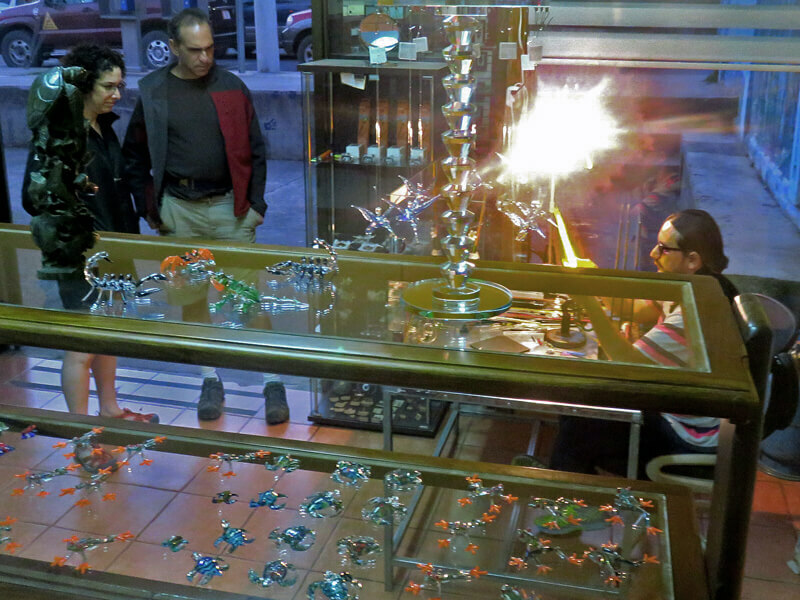 At the entrance to the Monteverde Reserve Store, you will usually find glassblower Angel Castellanos Gómez sitting at his table, creating exquisite animals with his torch and colorful glass. 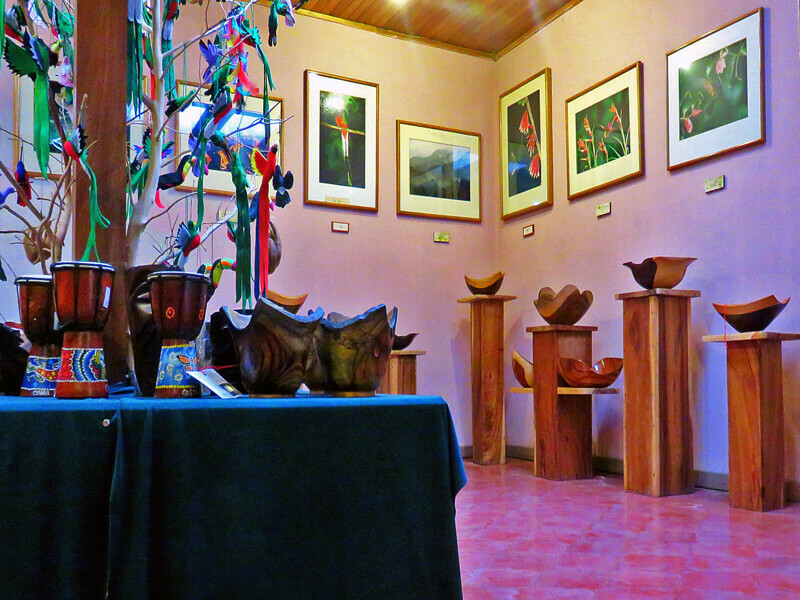 As you approach the Monteverde Cloud Forest Reserve parking lot, you will find one of the oldest souvenir shops and galleries in Monteverde, the Galeria Colibri or Hummingbird Gallery. It is famous for the incredible number of hummingbirds who have been visiting the (constantly replenished) feeders since the 1980s. Just sitting and watching these busy birds is a wonderful way to spend hours, perhaps fueled by local-grown coffee and delicious snacks from the Santa Marta coffee shop next door. 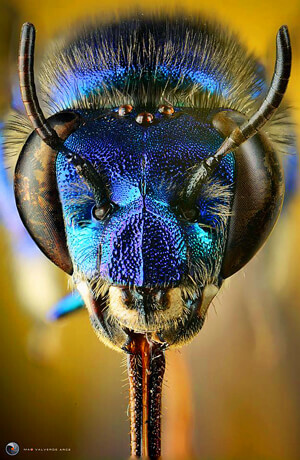 The stars of the gallery are the original photographs of flora and fauna taken by Michael and Patricia Fogden, who lived for many years in Monteverde. 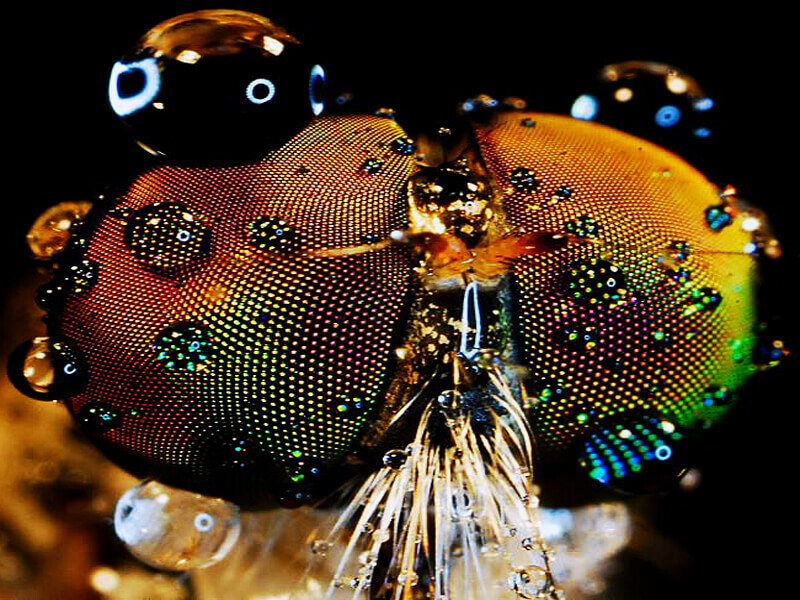 They are international wildlife photographers originally from England and most recently based in Ecuador. 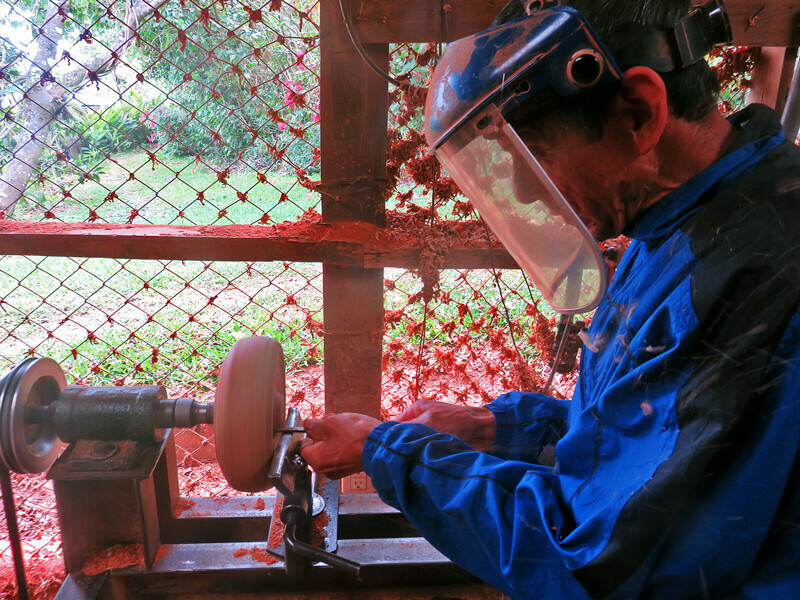 There are also beautiful bowls sculpted out of reclaimed wood by Wilson Arce Mendez who lives in Palmares. The gallery carries a number of books, t-shirts and other souvenirs. The store is open each day from 8 am to 5 pm and the phone number is 2645 5030. 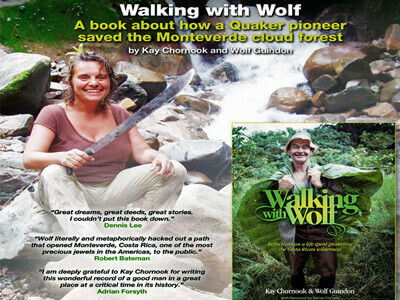 Wolf and Lucky Guindon were a young newly-wedded couple when they came with the other Quakers to Costa Rica in 1950. They developed a dairy farm, raised eight children and continue to be active in the Friends meeting and community activities. Starting in the 1970s, Wolf became involved in the founding of the Monteverde Cloud Forest Reserve and the Monteverde Conservation League, while Lucky raised their children and took art classes. All of their children are either artistically inclined or involved in biology, conservation or teaching. 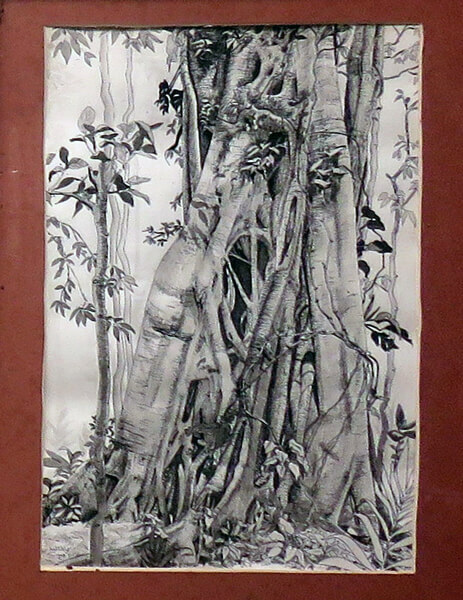 Lucky Guindon’s pen and ink drawings can be found in almost every home and building in the area. 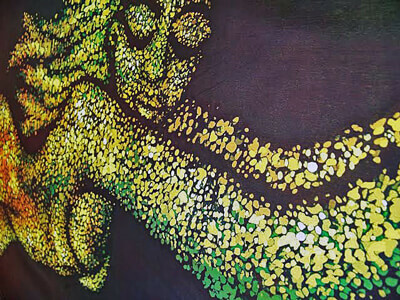 She creates them by sitting for hours and days in the forest, drawing in intricate detail the strangler figs and vegetation that abounds in this forest. She has both original works and prints for sale. 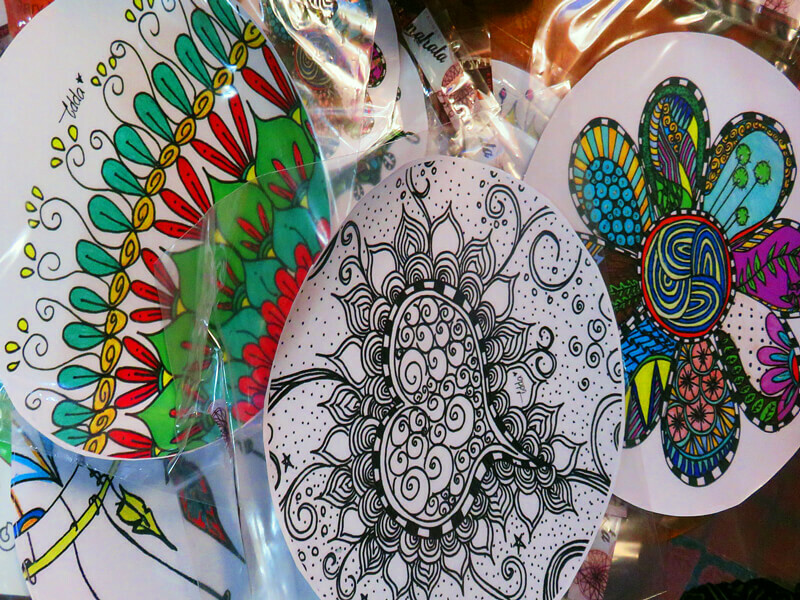 Her prints can be found at the Foresta Gallery in Cerro Plano and at Libreria Chunches in Santa Elena. Benito Guindon runs the family farm, creating delicious cheeses and kefir from the goat and cow milk as well as a variety of fruit jellies. His creative force is strong and you never know what he will be into next, but one thing you can usually find at the house are his woven pine needle baskets. 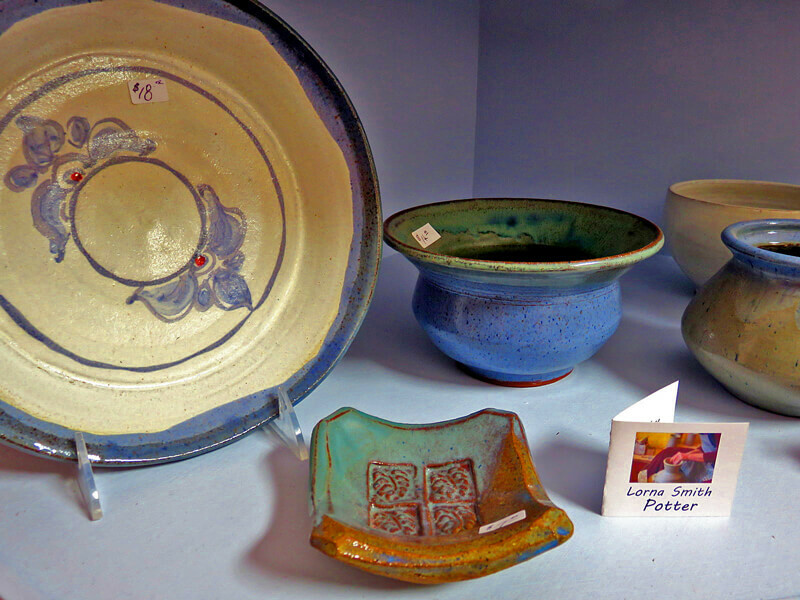 He makes unique plates, lidded baskets and Christmas tree decorations from long pine needles he collects locally. To arrange a time to view the Guindon family creations, you can call 2645 5862. 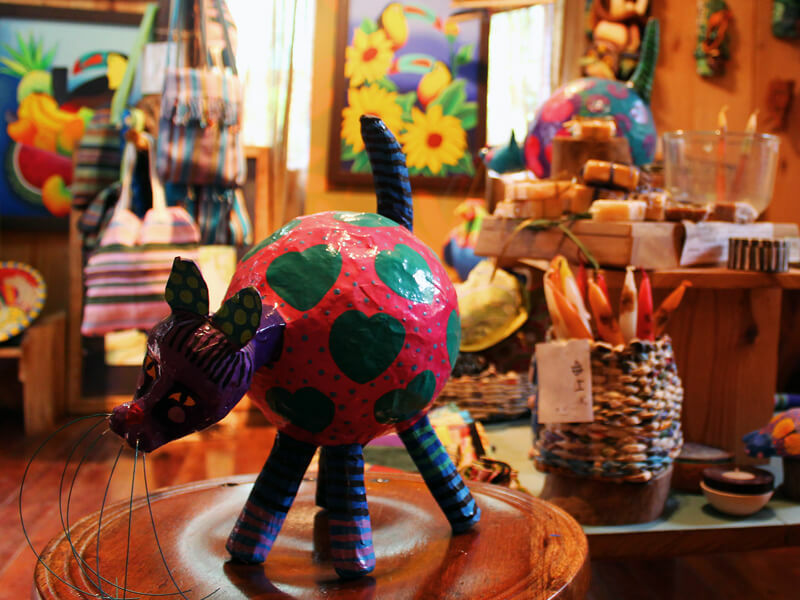 On the road that heads from Monteverde, past the entrance to the Guindon farm, to the picturesque valley of San Luis, you will find the Jaguar Art Studio. Roberto Wesson is a prolific painter who works mostly in oils and has sold his painting to collections around the world. His work covers many styles and techniques, from impressionism and expressionism to realism and surrealism, some based on photographic images and religious themes – with nature as a constant inspiration, reflecting Roberto’s years as a nature guide and his interest in ornithology and botany. 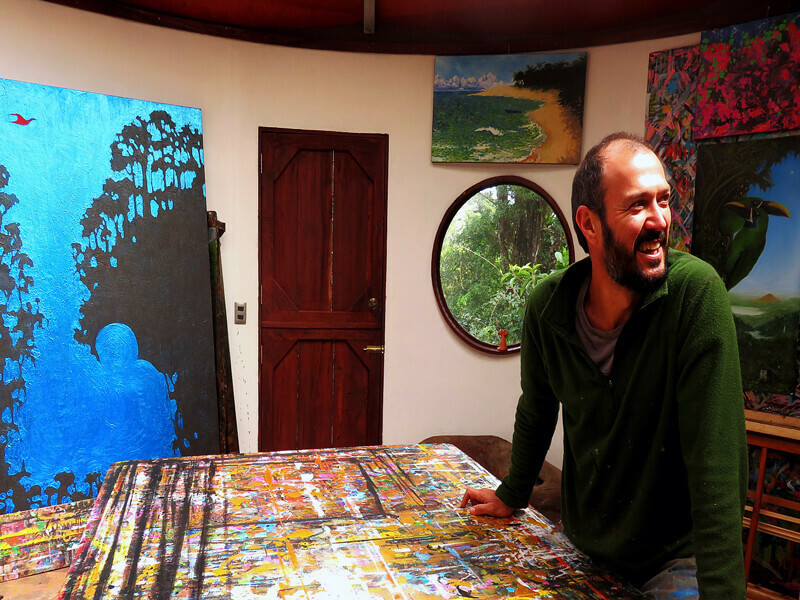 Roberto’s studio is in a lovely round building with natural light. You can visit and talk with him while he paints his big colorful canvases. He also sells prints at Luna Azul (see below.) Another highlight of his place is the more than 300 species of miniature orchids (Costa Rica has 400 species) that are on display outside the gallery. The studio is open most days between 10 am and 6 pm, or you can call his cellphone at 8359 5249 to be sure that he is there. Taking a walk or drive from Monteverde to San Luis, to see the beautiful views and stunning sunsets is a great way to spend an afternoon in Monteverde. Include a stop at the Guindon Farm (if someone is home) and the Jaguar Studio, which sits just 100 meters from where the views open out of the forest and sweep across the San Luis valley. 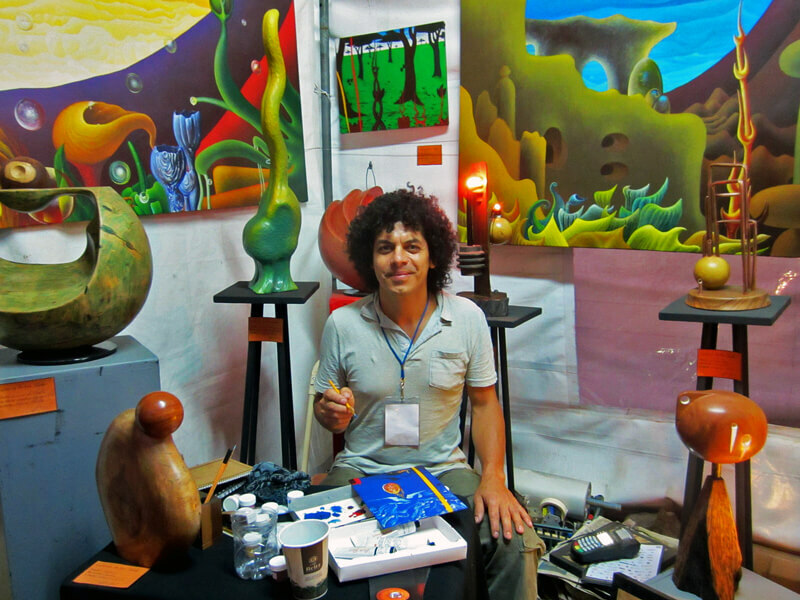 Paul Smith is one of the most creative residents of Monteverde. He has been painting since the early 1970s and many of those paintings are on display at the Hotel Fonda Vela which is owned by his children. Born in China, but a Canadian citizen, his work reflects his international travels and his love for landscapes. He also does impressive portraits and still life. 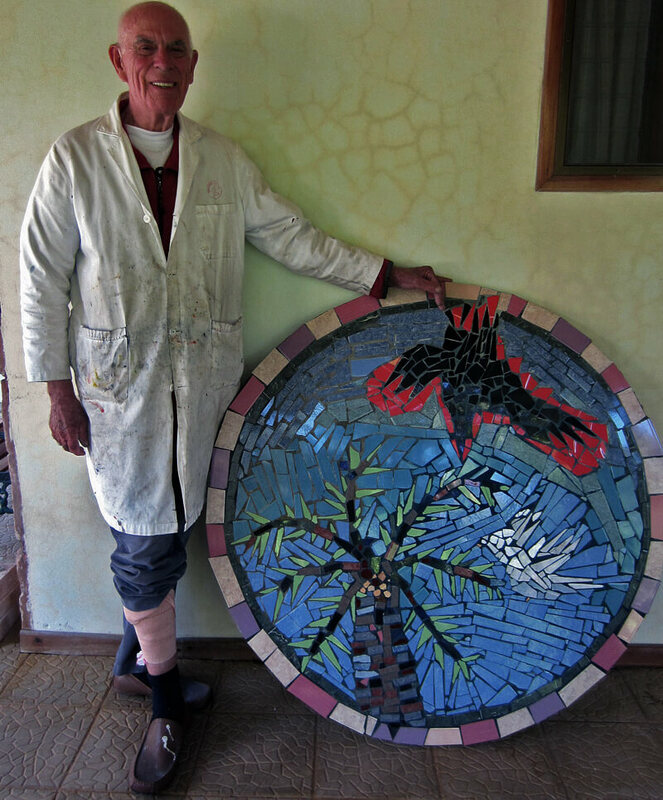 In the last couple of years, Paul became inspired to make mosaics and many of these are hanging on the outside walls at the hotel. There are also carved wooden plaques and larger painted murals. Margaret is Paul Smith’s sister and is as multi-talented as her brother – she plays piano and recorder, hosts gatherings for singers and Shakespeare readings, she paints, sketches and writes. Margaret was also the original force behind the famous Monteverde Music Festival back in 1992 which only happens sporadically these days. She creates beautiful writing paper, envelopes and calendars with her pen and ink drawings. Margaret has written a children’s book Once Upon an Island, which is available through Amazon. The Monteverde Conservation League has been around since the late 1980s. It owns the largest private reserve in Costa Rica, The Children's Eternal Rain Forest (or BEN as it is known here.). 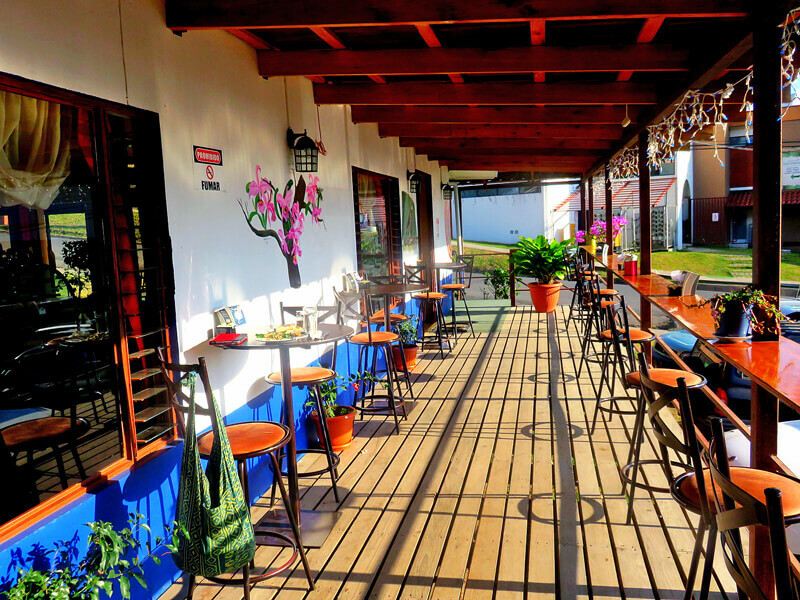 They have an Information Center across from Luna Azul and a systems of trails with educational facilities at Bajo del Tigre, the entrance being between Monteverde Centro and the Cheese Factory. You can take part in workshops, hike in a lower elevation forest (not cloud forest), birdwatch, enjoy night hikes and also look at the gardens created by ProNativa featuring indigenous plants. 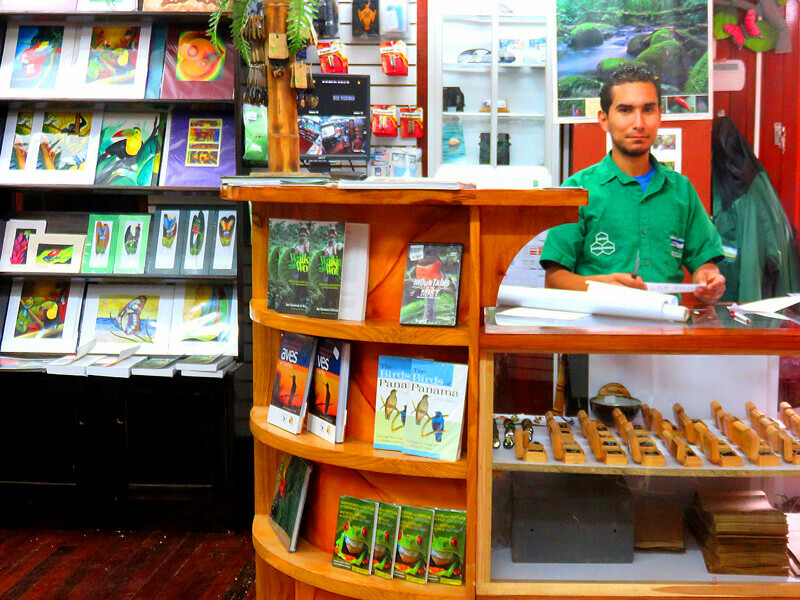 In both the information center and at the entrance to Bajo del Tigre there are small gift shops. 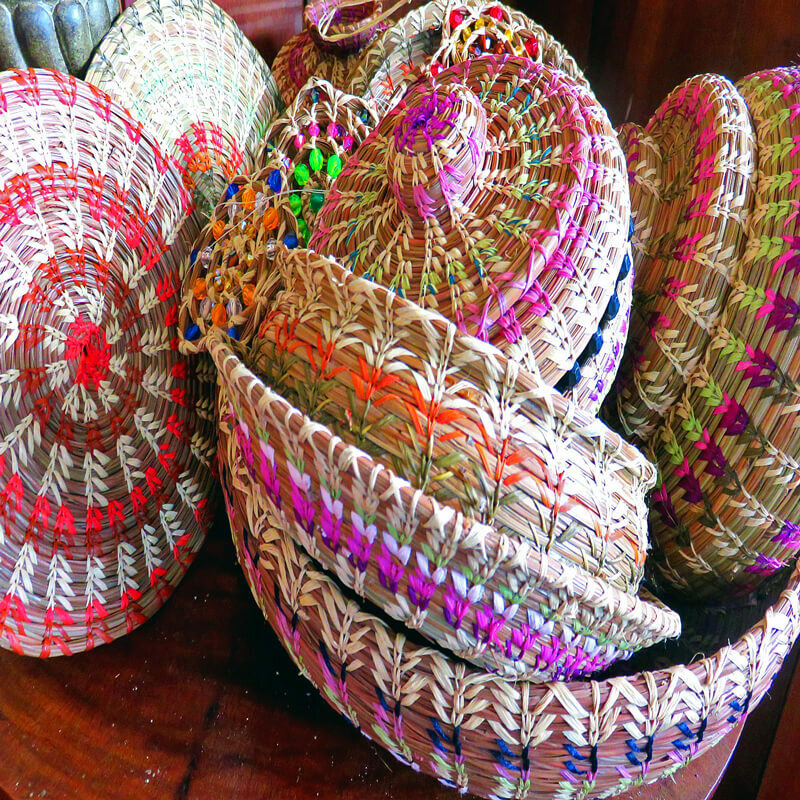 The products they carry are either directly related to BEN, t-shirts and hats, or books and educational materials related to the local forests and their conservation. 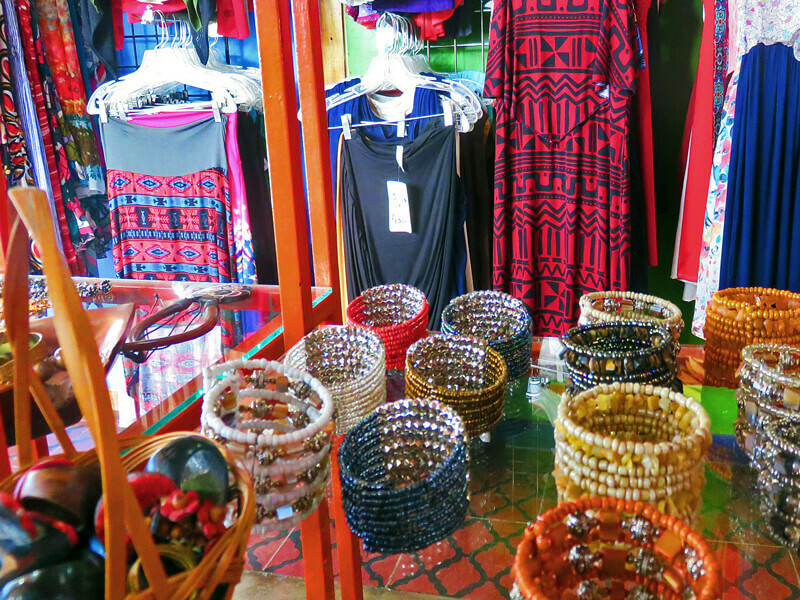 The store at the Info Center is open from 8 a.m. to 5 p.m., the store at Bajo del Tigre is open from 8 a.m. to 7:30 p.m. All the proceeds from the sales in these stores go to an endowment fund that supports the Children's Eternal Rain Forest, so your purchases are an eternal gift to the future of the forests in the Monteverde area. Their phone number is 2645 5003 and their website is www.acmcr.org. 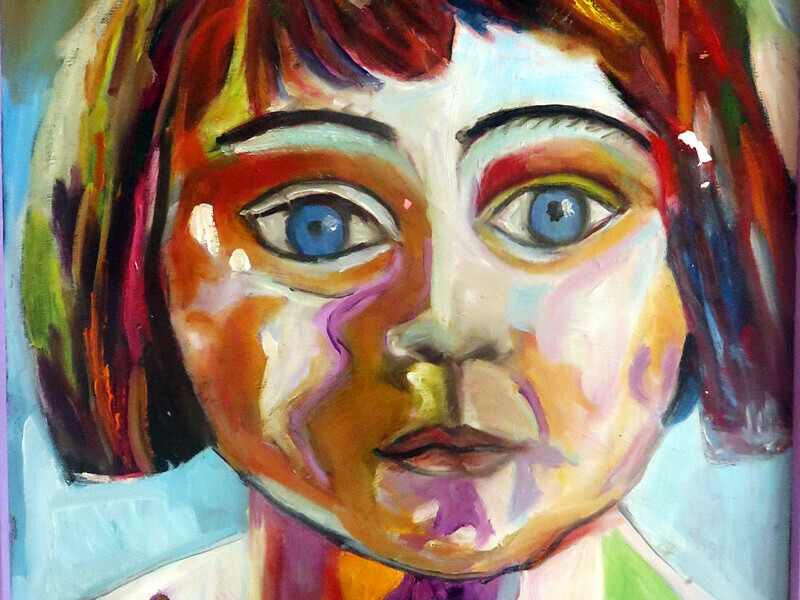 In 2014, following the deaths of two of Monteverde’s favorite artists, Meg Wallace and Turid Forsyth, some of their friends and fellow artists got together and started the Monteverde Artists’ Collection. 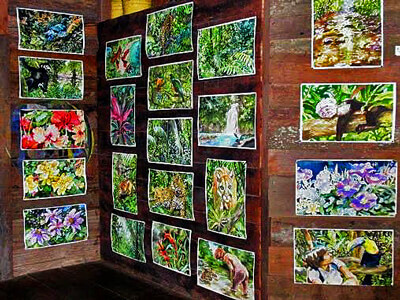 This is a collection of a sample of the works of local artists who wish to participate with the hope that one day there will be a Monteverde Art Museum. At this point, due to space, it only includes visual flat art, and the intention is to preserve examples of an individual’s work and make it available for anyone who wishes to view or study the art of Monteverde. Presently there are 16 artists represented and there is a rotating exhibit in the lobby of the Hotel Belmar – besides Turid and Meg, Meg’s mother Stella Wallace and Marco Tulio Brenes, who have both recently moved out of the community, have works in the collection. The art will be housed and curated by Marlene Leiton Campbell in the Campbell Library at the Monteverde institute (open Monday to Friday 8-5.) For a donation of $100, you can purchase a painting and the proceeds will go toward keeping the permanent collection. This cooperative was founded in 1982 by eight women and has grown to close to 100 members, including a few men. 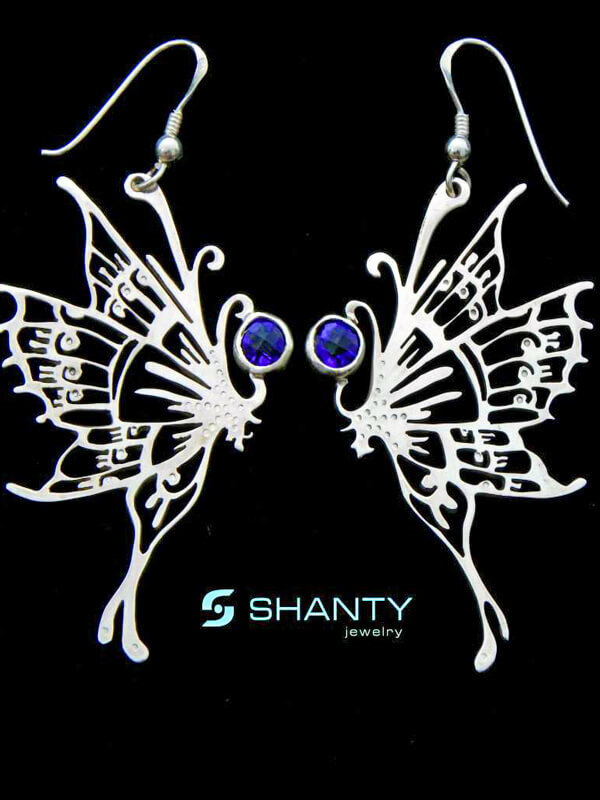 It is a non-profit organization that aims to provide income for local artisans, mostly working in their homes, who also gain self-esteem and independence as they support their families through the sale of their crafts. 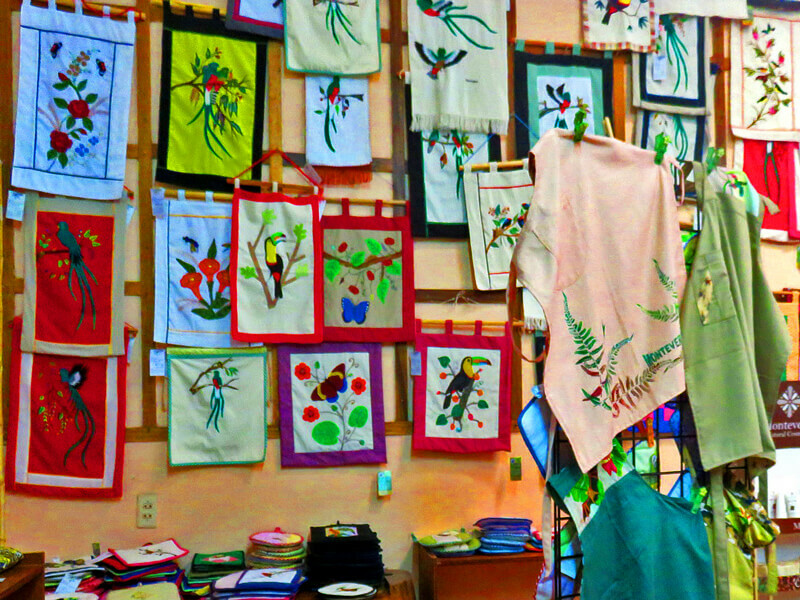 The store, in Monteverde Centro, has a wide range of gifts – from decorative wall hangings and fabric bags, aprons and potholders, to clothing, unique woodwork, ceramics and jewelry – made from sustainable indigenous materials. The coop also offers workshops and training programs. It is open Monday to Saturday from 8 am to 5 pm and Sunday 8-4. There is a café in the back that sells delicious “tipico” food, delivered at a “tipico” pace. You can email them at casemcr@yahoo.com or telephone 2645 5190. Patricia Jiménez was one of the founders of CASEM and continues to be a powerful force behind many artistic and community initiatives in Monteverde and Santa Elena. She is a poet, an activist, a mentor and a gifted painter. Patricia does acrylic paintings, often with a nature theme but just as often guided by her social and spiritual beliefs. Patricia makes paper out of both natural fibres and recycled newsprint that then become notebooks. She paints fabric, working with other women who then sew with it. There are few people in the community who have not benefited in some way from Patricia’s guidance and from her beautiful artistic contributions including her poetry. She is generally too busy to take phone calls, but her work, and often herself, can be found at CASEM. Monteverde Centro is a wonderful place to shop, relax, refresh and watch the locals, who visit while watching their kids, who play while watching their dogs, who may look relaxed but are always keeping an eye on the tourists. 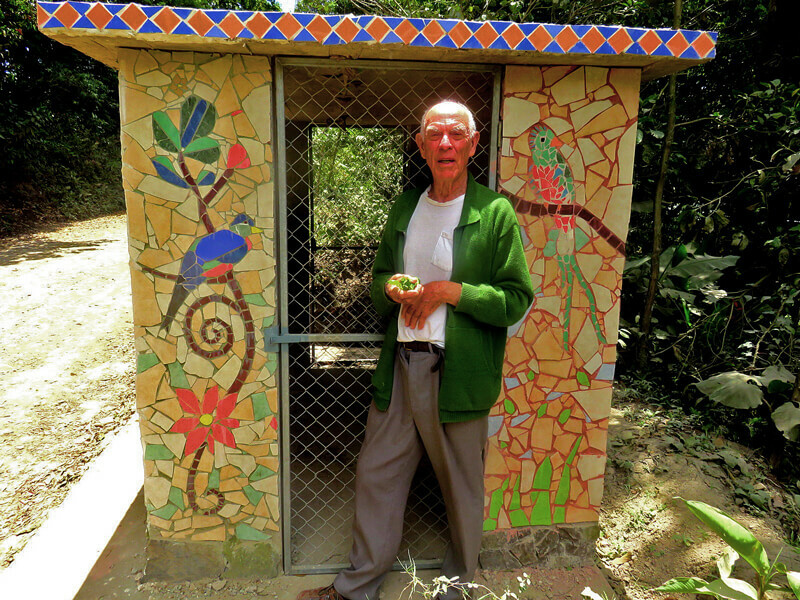 While meandering through the Monteverde area, you may notice several small concrete structures that have been painted or covered with colorful mosaics. 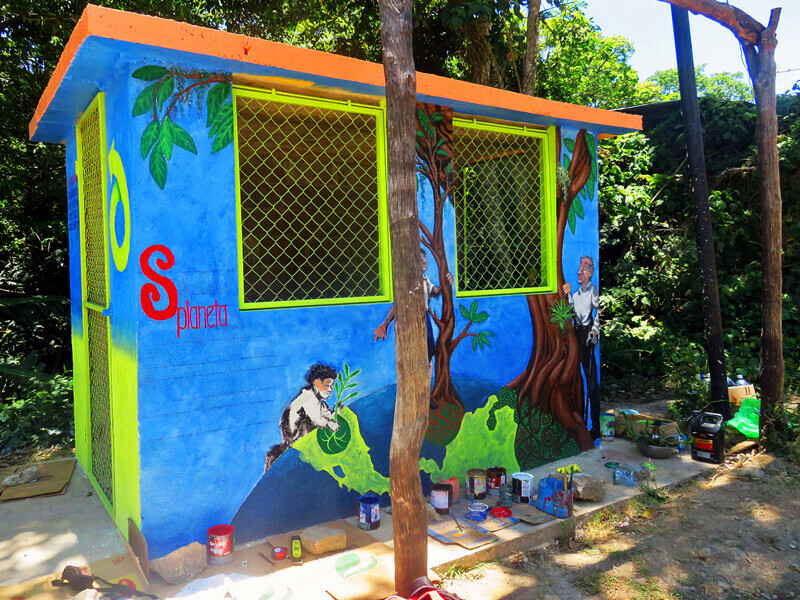 These are recycling collection centers and local artists such as Paul Smith, Hazel Guindon, and George Phillips have spent time beautifying them with the help of volunteers and the Environmental Education program from the Monteverde Cloud Forest Reserve. Take a moment to enjoy these community art-in-the-environment projects. 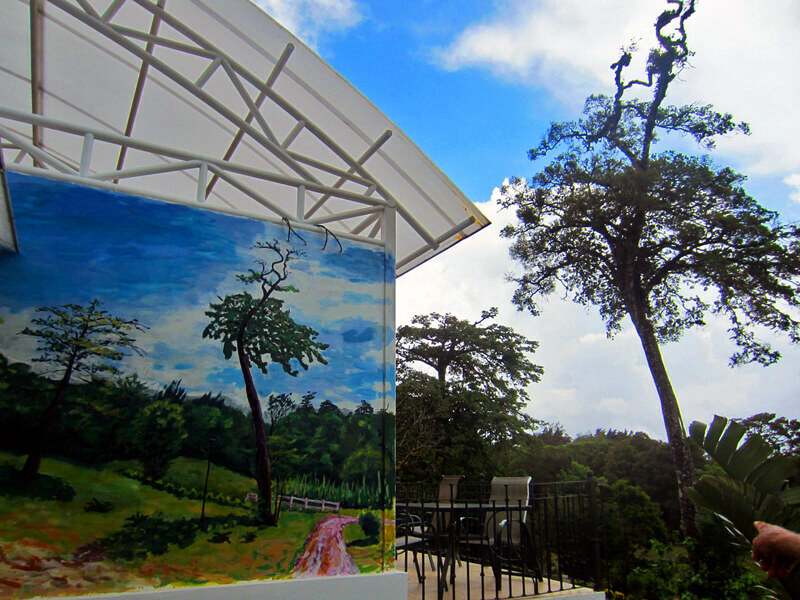 The Casa Alquimia B&B is an art workshop, gallery and family-run hostel situated in central Monteverde. 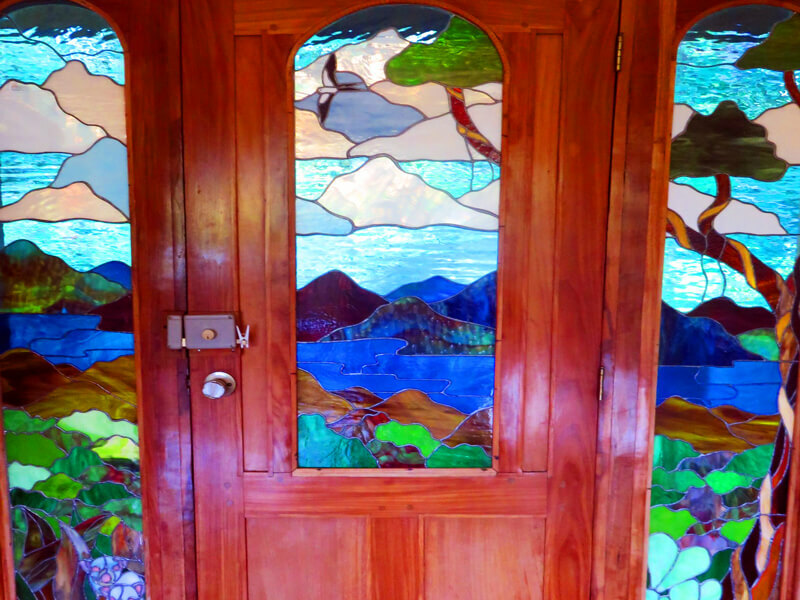 It is owned by artists Tarsicio Castillo and his wife Marianela who are from Ecuador but have been living in Monteverde for many years. They have created a very serene but sociable space with private rooms featuring beds for thirteen people and a shared kitchen. They welcome volunteers who will help them complete this on-going project and also guests who want to take part in workshops on painting, sculpture, ceramics, drawings, and jewelry making, using recycled materials such as seeds, bamboo, and leather. You can reach them at 8970 7760. 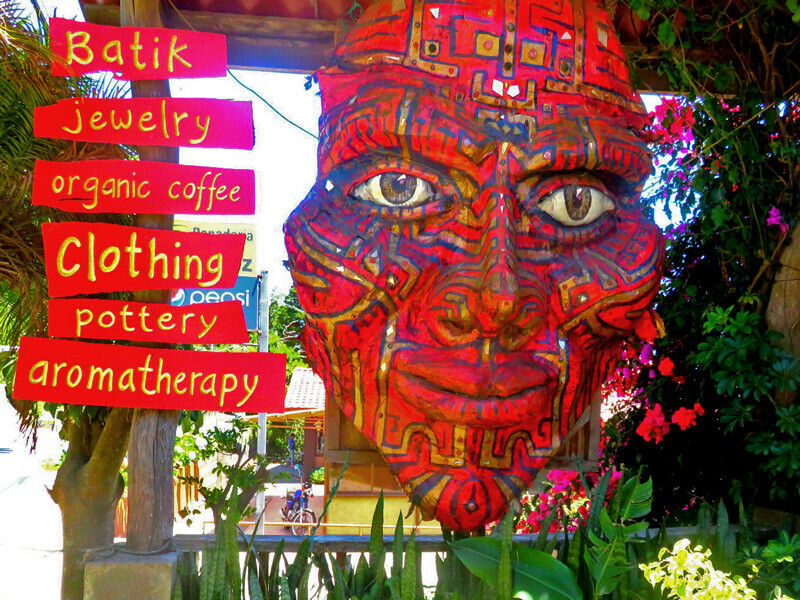 A little further down the road toward Santa Elena is a magical gallery called Foresta – you will know it by the large red mask outside (created by another very creative Monteverde resident Patrick Moore.) 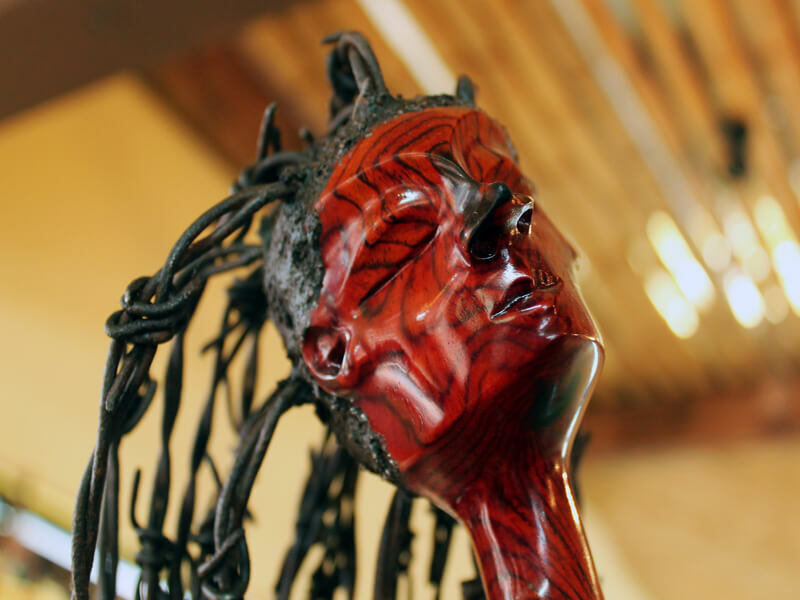 Opened by three local women in 2014, the number of artists it represents has grown from a few in the Monteverde area to several national artists as well. 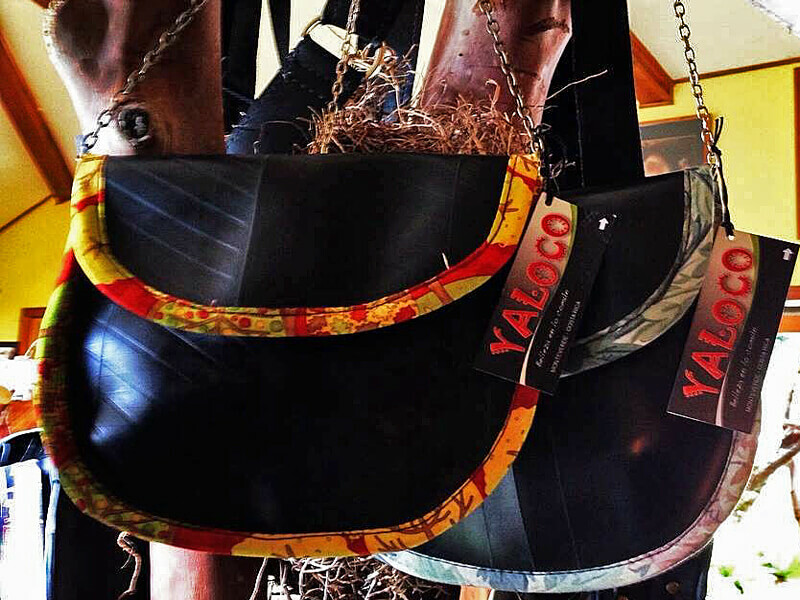 The products range from batiks to clothing to jewelry to aromatherapy and beyond. The owners, Paula Nijamkin, Milagros Rodriguez and Yamileth Lopez, have all been creators of stunning original art for many years. 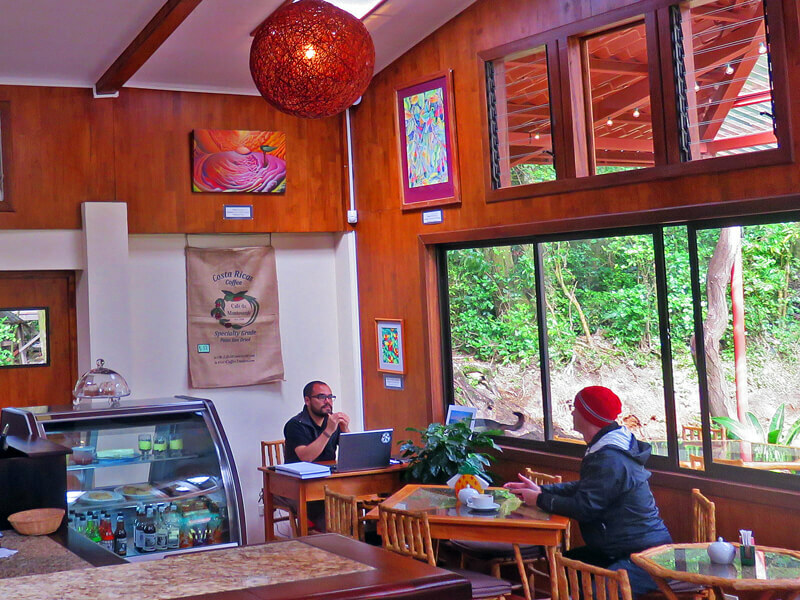 They also sell Café Paraiso coffee which is sustainably grown and roasted in nearby San Luis. The store is open seven days a week from 10 am to 6 pm and generally one of the artists is on hand. 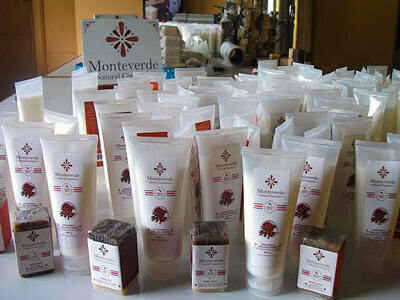 Their phone number is 2645-6081 and you can find them on Facebook under Foresta Monteverde. 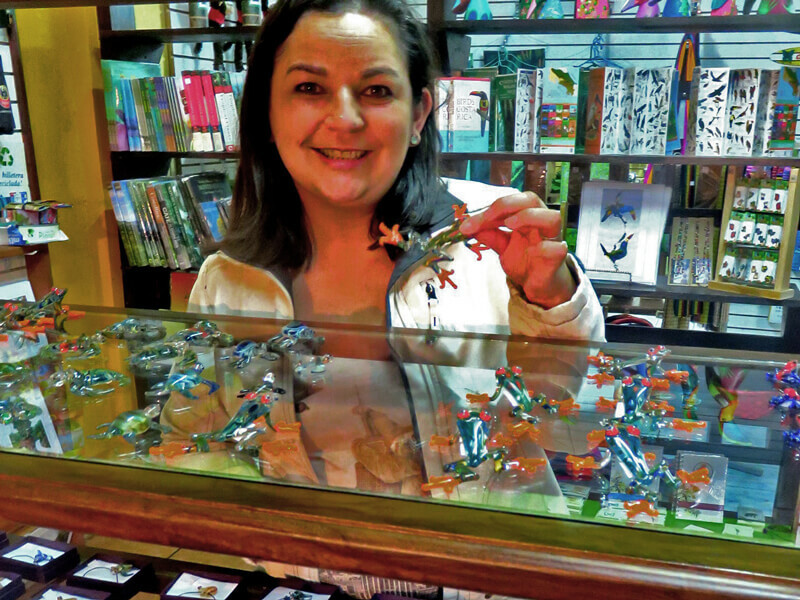 Paula is originally from Argentina but has been a creative force in the Monteverde area for over fifteen years. She specializes in an ancient Japanese technique, Rozome, which uses waxes and dyes to paint silk into ethereal batik wall hangings and scarves as well as fabric-covered notebooks. She also makes hand braided fabric floor mats. Originally a graphic designer from Peru but a Monteverde resident of more than fifteen years, Mili has been involved in numerous artistic projects over the years, sharing her talent and passion with many. She designs yoga clothing that she has made with Peruvian cotton by Peruvian weavers, creating a line known as Asana Yoga. She also makes ceramics that she fires in her wood kiln at her home in San Luis. Her clothing is also available in Nosara. Born in Atenas and trained as a psychologist, Bertalía followed her husband, a local man, to Monteverde in 1977. She came in the after-wave of two artists, Bill Kucha and Ron Tomlinson, who had inspired and taught many Monteverdians to develop their creative skills. She joined in with other locals in workshops and shared spaces of creativity. Bertalía was one of the founders of CASEM (see above). She works in watercolors, sculpture, paper-maché and whatever other medium excites her. 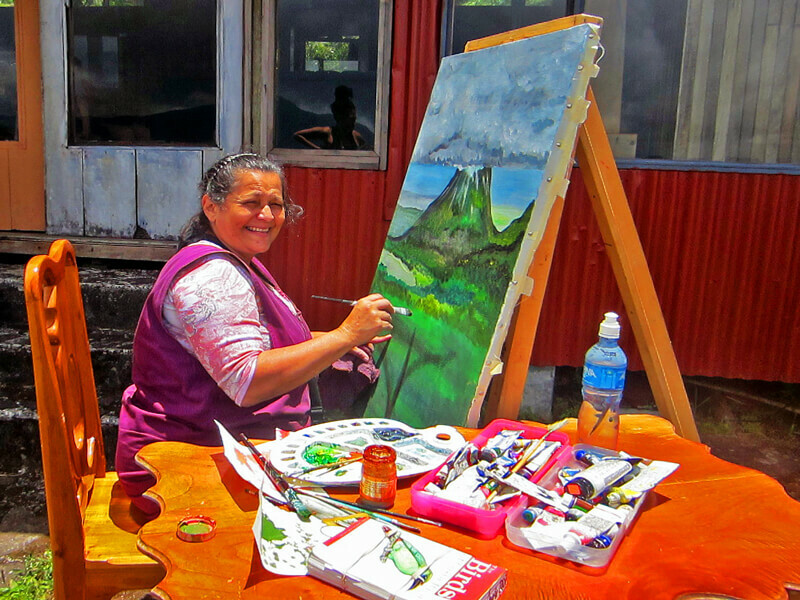 Bertalía can be found most days, being creative, at the Monteverde Art House. At the top of the steep hill coming out of Santa Elena is a small but well-stocked store specializing in South American products. It is a family run business, the de la Torre family arriving from Ecuador about fifteen years ago. 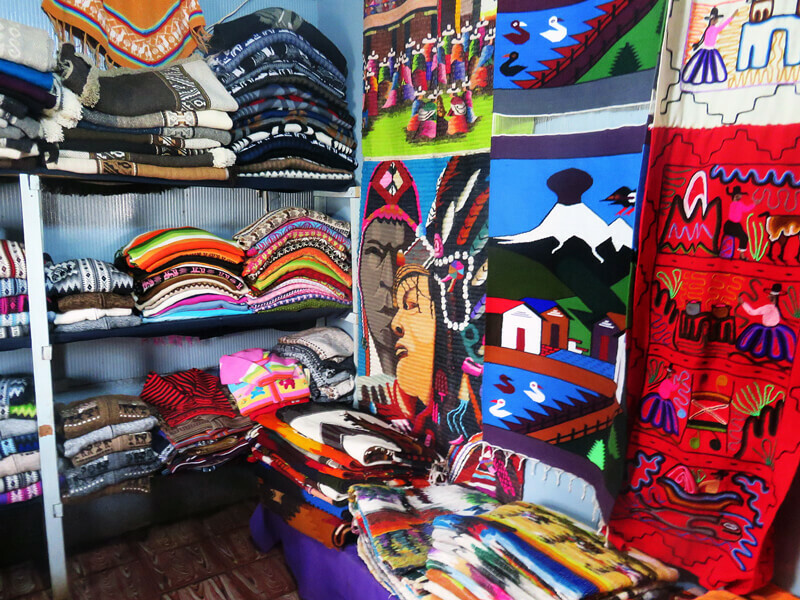 They make a number of the products themselves – hats, scarves and bags – and import colorful wool and cotton clothing, blankets and hammocks from Ecuador, Peru and Bolivia. Other stores in the area carry some of these kinds of products, but only this shop has as large of a selection. They are open every day from about 10 a.m. till 8 or 9 in the evening. You can call them at 2645 6738 to make sure they are open. There are several businesses in the mall worth checking out including the Saturday morning Farmers’ Market. However, the shops change regularly and so we leave you to discover the place on your own. 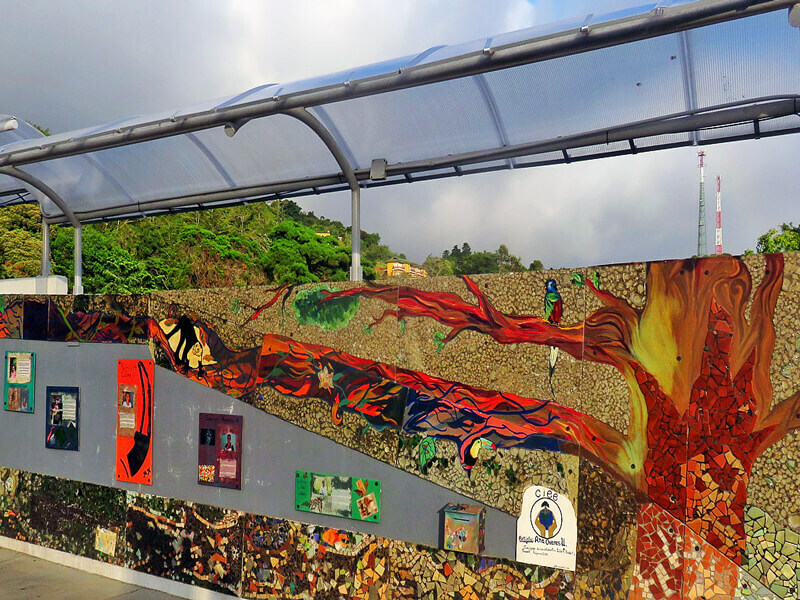 The artistic part of the mall, which is also where the buses from San José and Puntarenas arrive and depart from, are the large murals painted by Roberto Wesson (see above). A stroll around the parking lot to see the massive colorful hummingbird, toucan, manakins and forest scenes is definitely worth the time and they make an excellent backdrop for photographs. 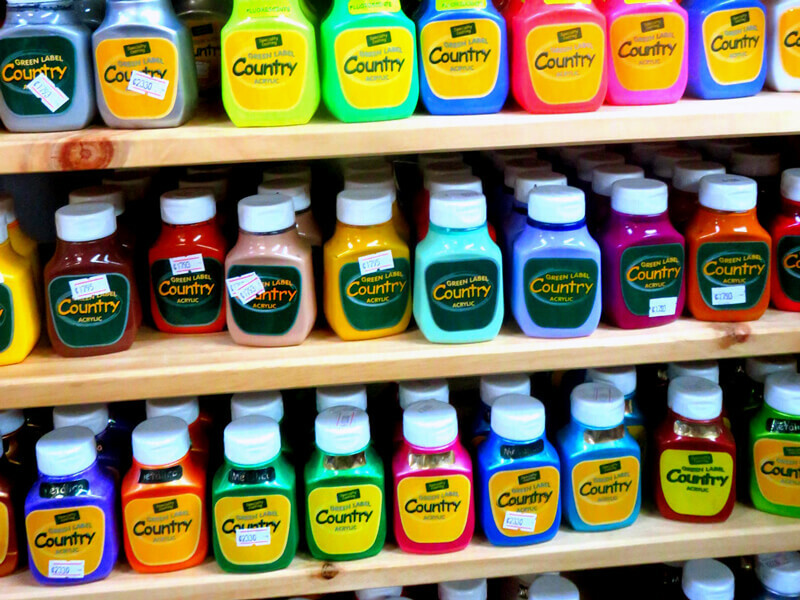 Chunches is a book, art and office-supply store in the heart of Santa Elena. You can find school supplies, a variety of paints, pens and paper, printer inks, camera accessories and much more. You can make copies here. There is a selection of souvenirs and gifts as well as books for adults and children. Chunches carries many cookbooks, children’s story books, and field guides, in both English and Spanish, by national and local authors. They also carry a variety of pocket-field guides, inexpensive quick references of birds, mammals, amphibians, plants and fish that have been laminated to stand up to the often damp muddy conditions you find in the rainforest. Many of these have been illustrated by Monteverdian artists. Below is a bit of information about some of the local authors and you can find their books in a number of local stores. Chunches is open every day from 8 am to 6 pm. The phone number is 2645-5147. 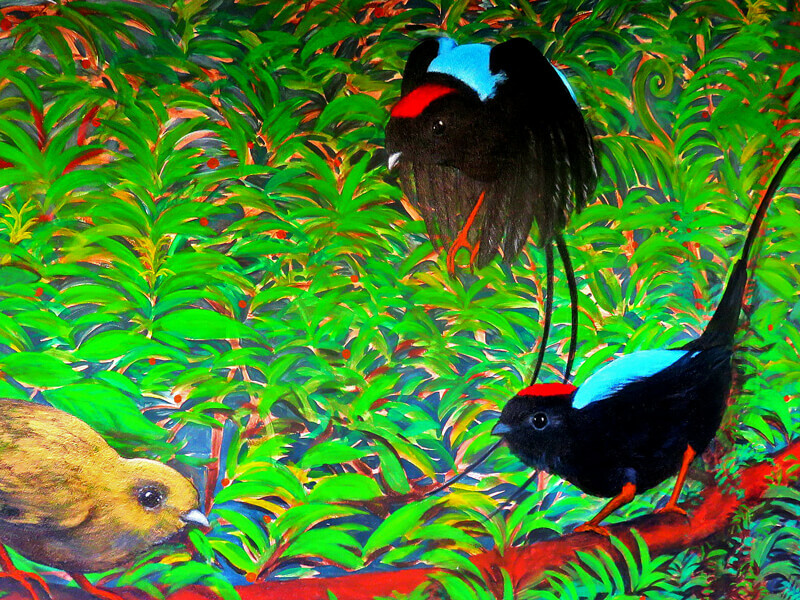 Mark is a British naturalist, artist and writer who has lived in Monteverde since 1991. He wrote and illustrated the Natural History of Costa Rican Mammals, as well as a children’s book, Jungle Jumble and illustrated a number of the pocket-field guides including mammals, amphibians and reptiles. He has co-produced a number of natural history videos and his smooth voice can be heard narrating videos made in the area. Another import from England, Robert has lived in Costa Rica since the early 1990s. After a successful career as a musician, he became passionate about ornithology and has illustrated a number of pocket-field guides of birds in Costa Rica, Panama, Peru, Belize and Florida. He is the illustrator of The Birds of Costa Rica (First and Second Edition) and The Birds of Panama: A Field Guide. Robert can often be found in area venues playing guitar with his local band Chanchos de Monte or jamming with other musicians of the area. Across from Chunches, on the outside deck of the Pension Santa Elena and Taco Taco Taqueria, you can almost always find Rodrigo. 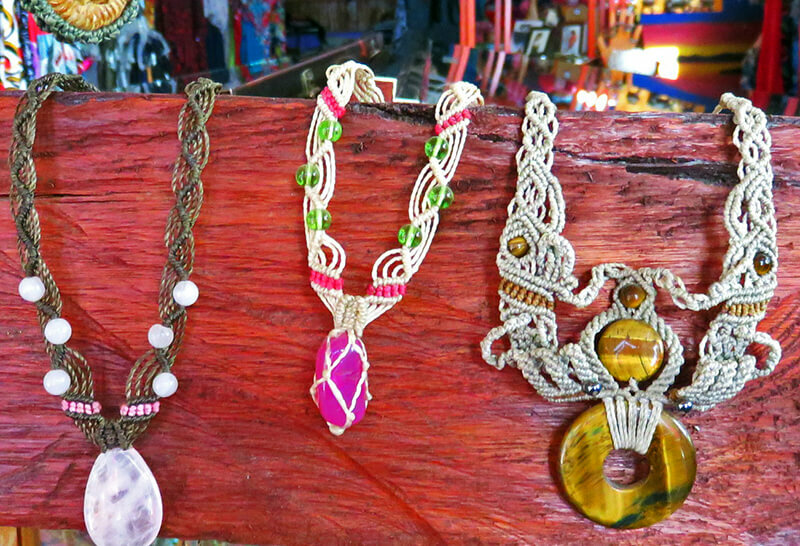 Chilean by birth but with many years in Monteverde, he sells his beautiful macramé jewelry under the name “Solamarillo”. At times he is joined by other “street artists”, making the Pension Santa Elena a very enjoyable place to hang out, where you can eat delicious tacos, listen to the eclectic mix of music being played in the pension, visit with travelers from around the world and perhaps even do a little shopping. Next door to Taco Taco, at the entrance to the Banco Nacional, is a wall that has been dedicated to raising consciousness about sustainability through art. There is a three-year contract between the BN and CIEE (Center for International Educational Exchange) under the mentorship of local artist Ana Ovares. Using recycled materials, and through the mediums of mosaic, painting and poetry, the purpose is to get people thinking about what they are consuming and what they are wasting. Every six months, when new CIEE students come for a semester of courses on sustainability, Ana involves some of them in another project that looks at different aspects of community life, but always within the theme of awareness about trash and consumerism. It is well worth stopping to see the work by Ana and the students, and to reflect on your own consumption and waste patterns. 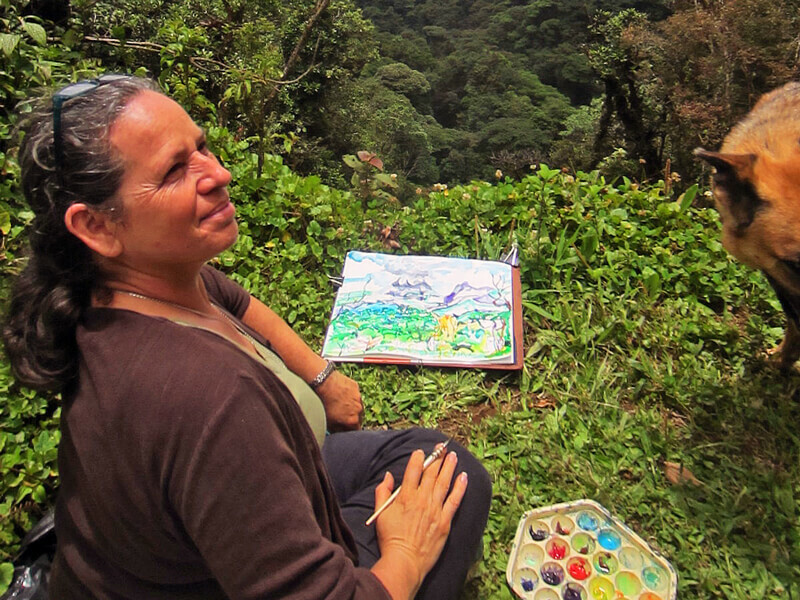 Ana Ovares grew up in the Monteverde area and has been creating art all her life. 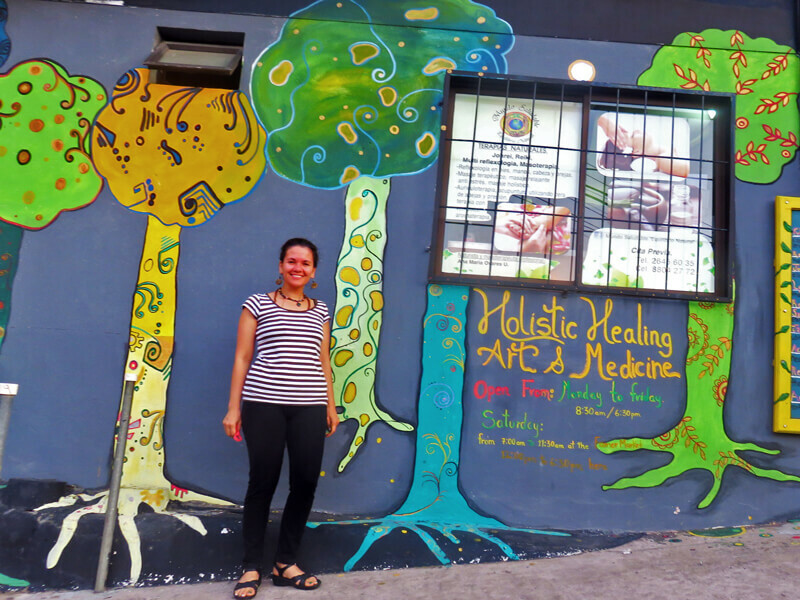 She is also a holistic practitioner and runs the “macrobiotica” store that is across from the Supercompro. Besides being a massage and holistic health therapist, and a poet, Ana describes her creations as “conscious art” which she expresses through ceramics, painting, mosaics, sculpture, and candle-making. She can be found most days at her Holistic Healing Arts & Medicine store which is open from 8 am to 6:30 pm except Sundays. You can call her at 2645-6035 or her cell 8804-2772. 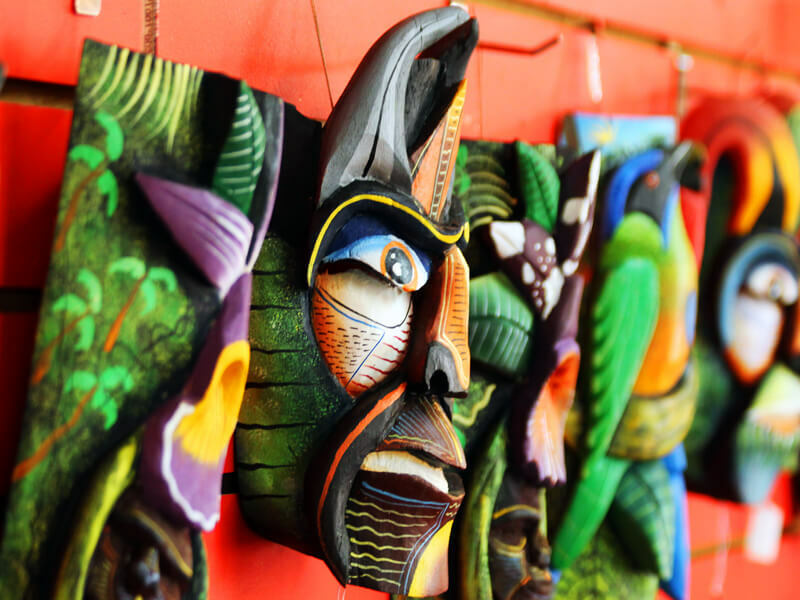 Since this is mostly meant as a guide to the arts and artists of the Monteverde area, we will not linger on the stores that are basically souvenir shops, but two of the biggest ones in downtown Santa Elena are Selvatura and Camino Verde, which are both also tour offices. Every kind of souvenir can be found in these stores and they are almost always open. In Costa Rica there are many musicians in many genres who have CDs available. You will find these CDs in many of the shops. Beyond the more obvious sounds of salsa, meringue and cumbia, you can find recordings by Costa Rican artists of classical, jazz, calypso, contemporary Costa Rican or nueva cancion, traditional, rock, reggae, as well as many videos. The CD Simbiosis, by pianist Manual Obregon, was recorded here in the Monteverde cloud forest and incorporates the musical sounds of nature with lyrical piano melodies. Please take a few minutes to listen to some music from this country and support the talented musicians by buying a CD or 3. 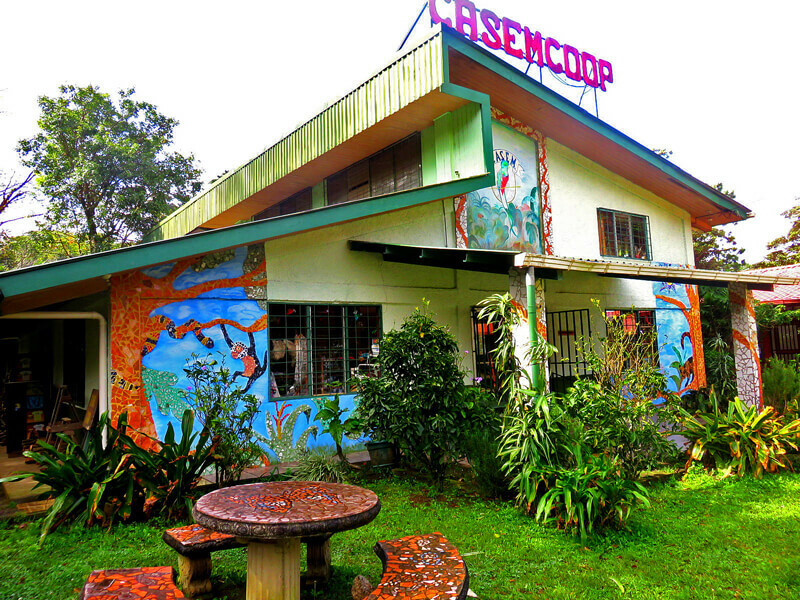 In the same building as, and part of the same business as the food market, Supercompro, is the Woods Art Gallery. 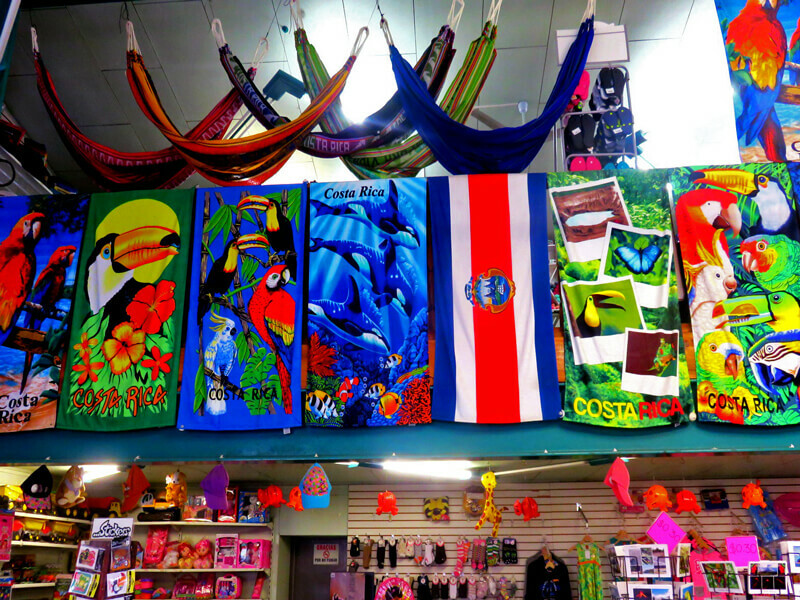 This large store has many of the same souvenirs you will find in the other souvenir shops as well as a large t-shirt and hat collection, but it also has a large selection of Costa Rican wood art on the top floor. It is worth going upstairs to take a look at, and maybe purchase, the many different wood sculptures, some larger than life, and the more traditional wooden bowls, canisters and utensils. 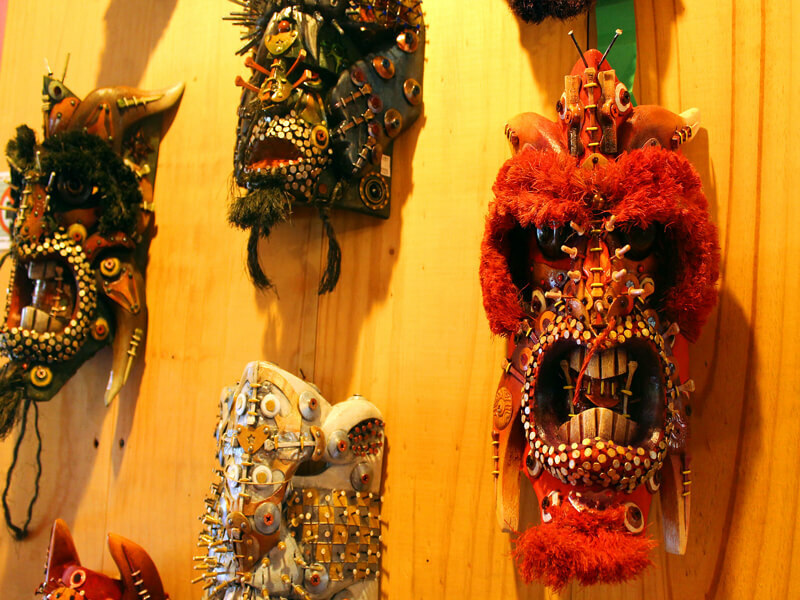 You will also find masks, paintings and other sculptures. 2645-6668. It is open all day, every day. A couple of doors down from Vitosis is a small but packed sports store, Deportes Andrey. It is very much a store meant for “deportistas” and carries good quality clothes and shoes, particularly for soccer players. They also carry bags and equipment for camping and cycling. 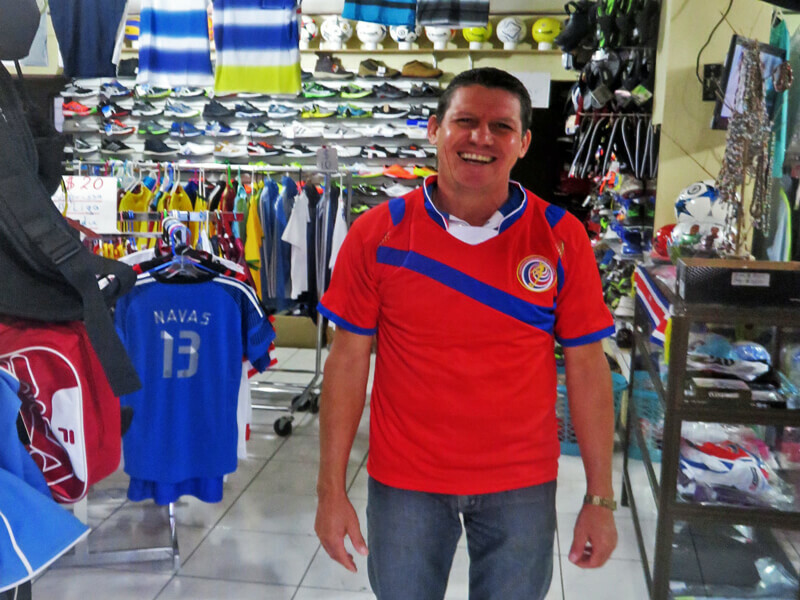 The reason we mention it here is that with the rise in popularity of “futbol” and the Costa Rican national team’s success in the 2014 World Cup, many people have taken an interest in finding national team uniform shirts and this is a good place to look. They also have water bottles and mugs with team logos. The store is open Monday to Saturday from 9 am to 6:30 pm. You can call them at 2645-6187. GOOOAAALLLL! On the road that runs behind Bar Amigos (or follow the steps below Supercompro and past Quimera Restaurant and turn left) is a rustic little shop that specializes in seed and bead jewelry. 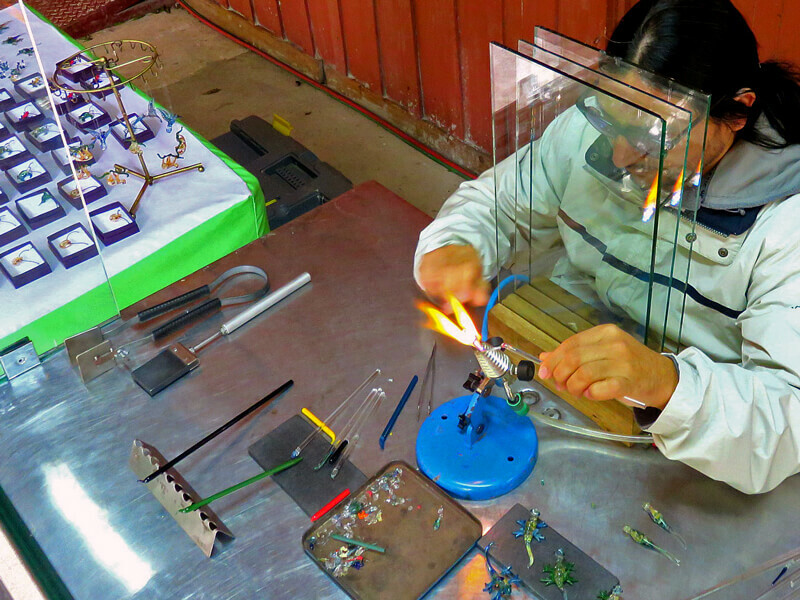 Graciano Ramon makes most of the jewelry himself. He is originally from Cartago and arrived in Santa Elena about 12 years ago and opened his shop in the front of his house. 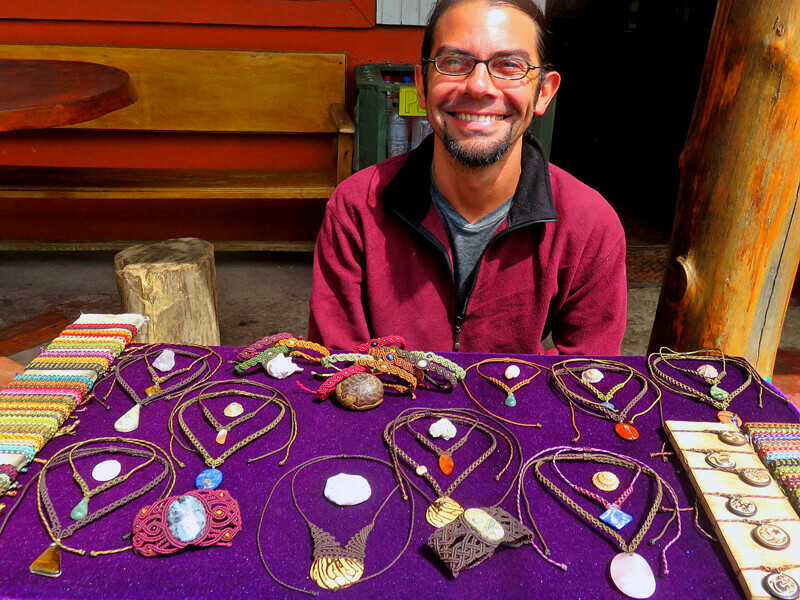 He does carry some other artisans’ work but you can be assured you will see a variety of seeds and natural products put to good use in the jewelry he sells. He is open every day from 9 am to 7:30 pm. You can reach him at 8557 3810. 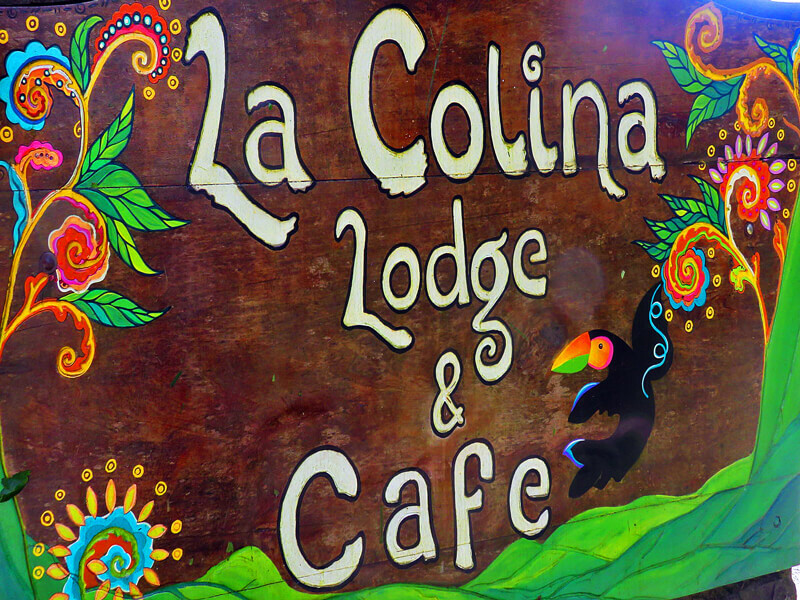 When you leave the Panamerican Highway and head toward Monteverde, you will pass through the little community of Guacimal. We want to mention a new venture that started this last year that is proving to be a hotbed of cultural and community activity. 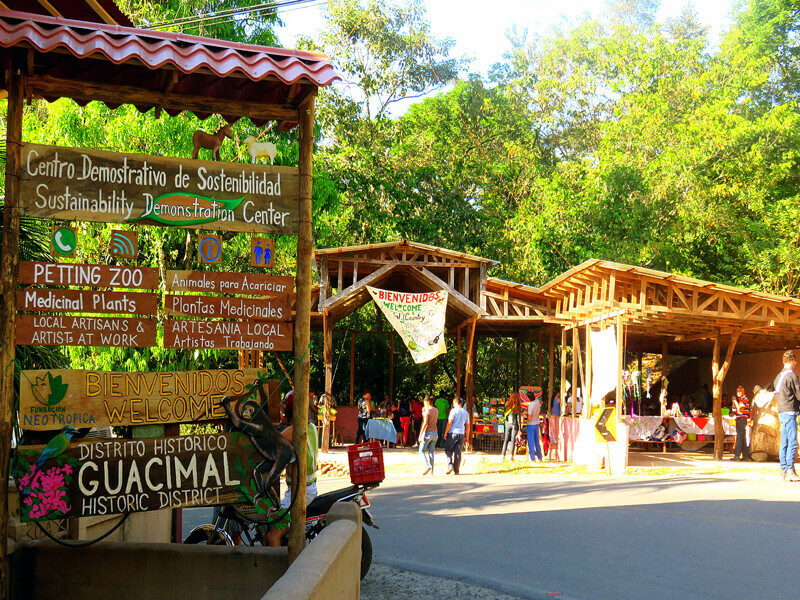 The Sustainability Demonstration Center, also known as La Casona de Guacimal, began in 2014 as a refurbishing of this beautiful building that was a hub of activity decades ago but has sat empty for the last twenty years or so. 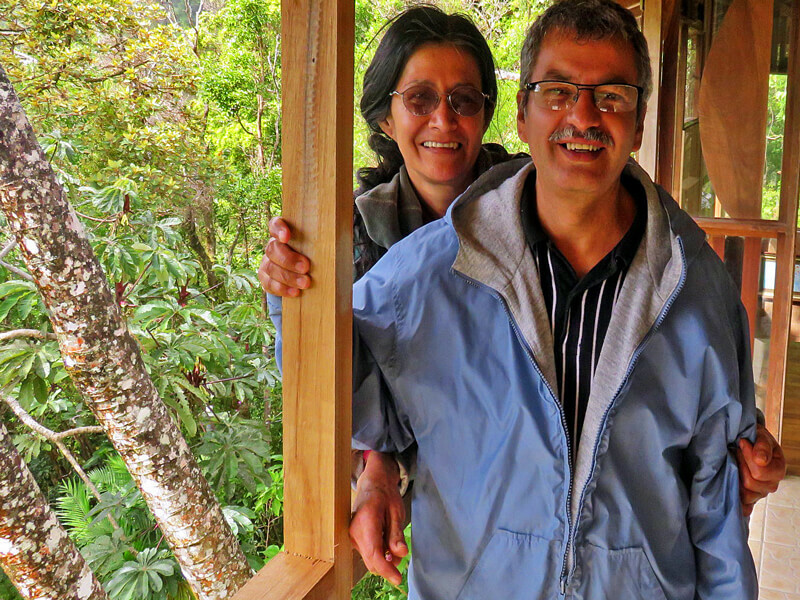 Verónica and Alexander, originally from Monteverde, bought it with the intention of opening it to the community. There is now a Saturday Farmers’ Market, workshops, a petting zoo and a small gallery of local artists such as sculptor David Villalobos, in and around this cultural center. You can contact them at 2647-1057 or stop by when passing through Guacimal. If you come to the Monteverde area from Tilarán, you pass through the outlying community of Cañitas where the signs will start telling you that you have arrived in Monteverde. 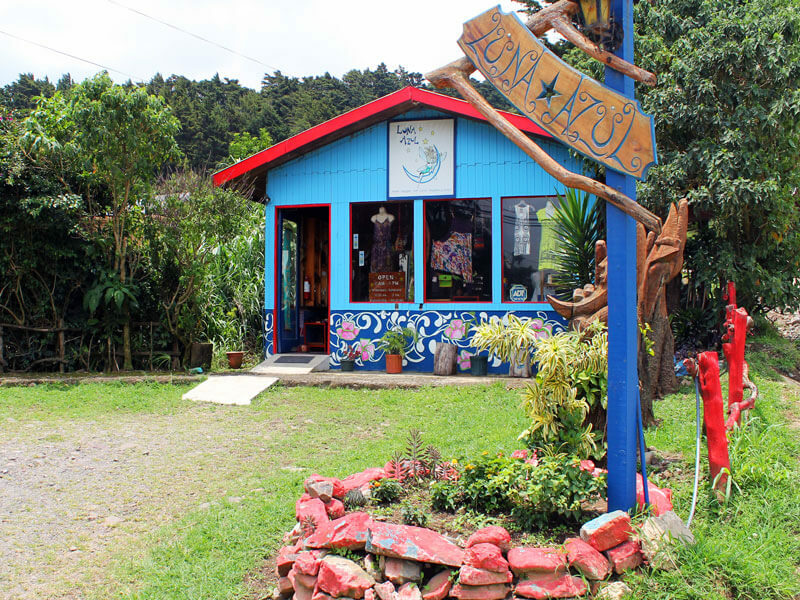 It is well worth a stop (or it is also possible to walk, drive or taxi there from Santa Elena) to see not just the shop, but the property of Licho and Danis, a friendly creative tico couple. Licho is a master woodworker, turning bowls, canisters and plates out of different woods from trees that have fallen down naturally. His favorite is rosewood, or cocobolo, and thus the name of the shop. 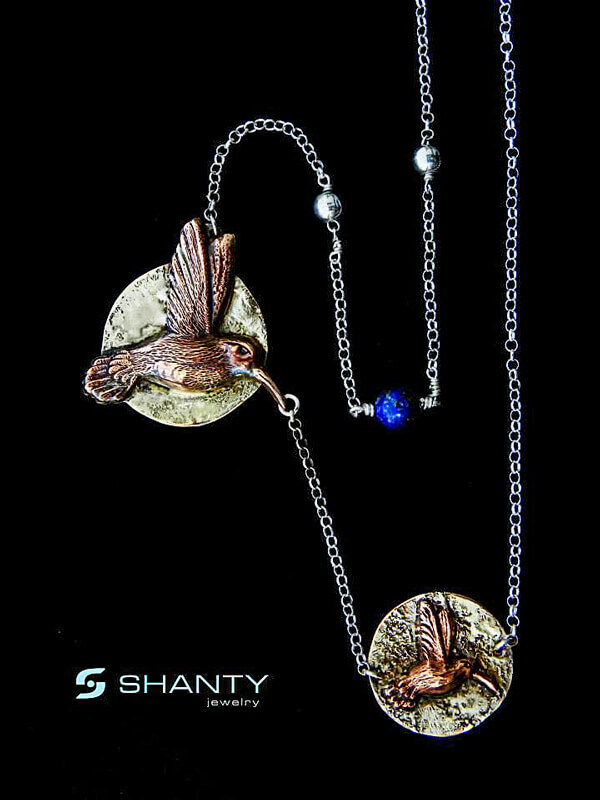 Danis makes jewelry, mostly out of recycled materials, including paper, seeds, cans, flowers and copper wire rescued from microwaves. 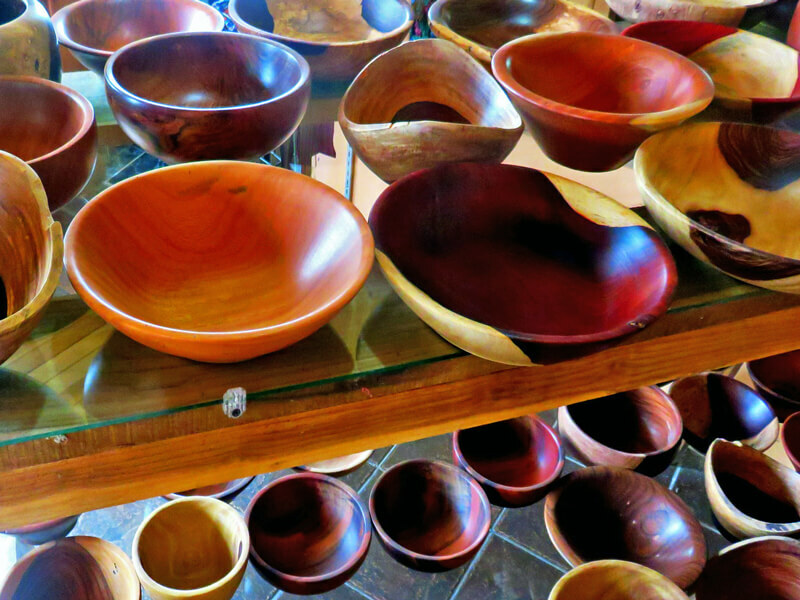 Not only is their store packed with wonderful wood creations and jewelry, but Licho will be more than happy to take you on a walk through his finca,past the coffee bushes, pointing out the different species of trees and proudly showing you the myriad of orchids that he has. It is a short walk through the garden to his woodshop where he will show you how to turn a bowl on the lathe. He only uses beeswax on his wood pieces so they are safe for food; he returns the wood sawdust as composted mulch to his garden. It is impossible not to get caught up in his enthusiasm and friendly approach to sharing this little piece of the Costa Rican campo with tourists. In old-fashioned typical tico-style, Licho and Danis open their home and hearts to you for free. You can call them at 2645 6456 to arrange a time to have a tour, or you can just stop by. We highly recommend that you go – it may be one of your favorite memories from Costa Rica. WE TRIED TO INCLUDE AS MANY LOCAL ARTISTS AS POSSIBLE (APOLOGIES TO ANYONE WHO HAS ACCIDENTLY BEEN LEFT OUT!) PLEASE LET US KNOW IF YOU WANT TO ADD YOUR CRAFT OR ART SHOP HERE!